(Tech Xplore)—Sony earlier this week revealed a 3-layer stacked CMOS image sensor with DRAM for smartphones. What that kind of construction means in user terms: high speed data readouts, minimized distortion in still images of fast-moving subjects, in that they are captured with minimal focal plane distortion. Also, there is that benefit of getting "super" slow motion movie shooting, at up to 1,000 frames per second. Andrei Vlad in Softpedia noted impressive details. "The Japanese company says the sensor's DRAM capacity is 1 Gigabit (125 MB) and that it can read one still image of 19.3 million pixels in only 1/120 second, which is four times faster than conventional products. Moreover, the sensor supports shooting of super slow motion movies with a maximum frame rate of 1,000 fps in full HD (1080p)." As for this slow motion video, Brad Linder in Liliputing said what is special: "Plenty of smartphones can record slow-motion video. For example, the Google Pixel phones can record 720p video at up to 240 frames per second and then play back the video at 30 frames per second, making everything appear to move 8 times more slowly. But Sony's new smartphone camera sensor is the first I'm aware of that's designed to support 1080p slow-motion video at 1,000 frames per second." Sony said that since the high-speed shooting data is stored on the DRAM and output at a normal speed, a conventional ISP can be used. The company detailed construction features in their news release. 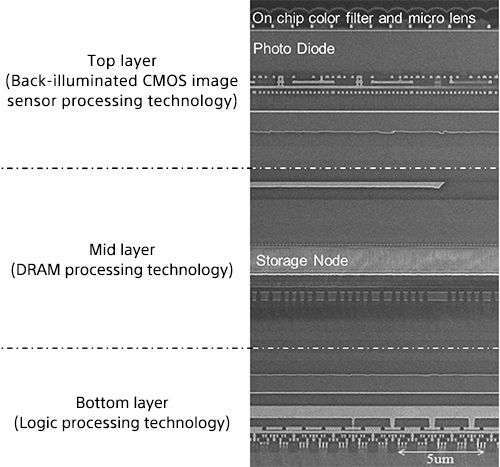 A DRAM layer is added to the conventional 2-layer stacked CMOS image sensor with a layer of back-illuminated structure pixels and a chip affixed with mounted circuits for signal processing. Commenting on the Sony sensor for smartphones that "packs its own DRAM inside" JC Torres in SlashGear said the DRAM acts "as a sort of holding area that can quickly read data coming into the sensor that can then be passed on to a slightly slower processor down the line. In practice, this means that the sensor can capture the same amount of pixel information at a fraction of a second. " Addressing the noise factor, Sony in its announcement said that "the sensor also includes solutions for the various technical problems inherent in the design, for instance, reducing the noise generated between the circuits on each of the three layers." For those not yet familiar with CMOS technology, a search easily provides some background information. Digital cameras used CCD (Charged Coupling Devices) to turn images from analog light signals into digital pixels. CMOS imaging stepped up the game. CMOS stands for Complimentary Metal Oxide Semiconductor chips. EngineersGarage: "Advent of CMOS technology in eighties led to the phenomenal growth in semiconductor industry. Transistors have become smaller, faster, consume less power, and are cheaper to manufacture. It is CMOS technology which has enabled very high integration on the chips leading to modern high performance, miniaturized integrated circuits." 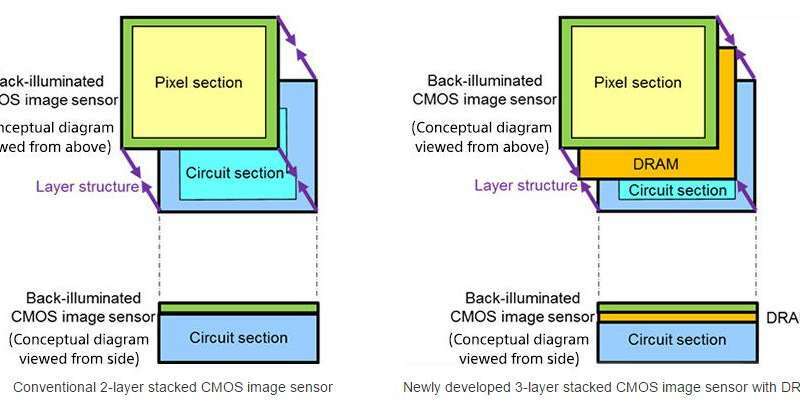 Commenting on the 3-layer stacked CMOS sensor (with DRAM) for smartphones Jordan Palmer in Android Police said it had the potential "to lend itself to some amazing leaps in mobile photography." So when will this beefed-up sensor feature show up in stores selling smartphones? The answer is that nobody knows yet. "Although there is no word on when the sensors will make their way into smartphones or even which smartphones may be considered, this is very good news for mobile photography enthusiasts and consumers alike," said Daniel Golightly in Android Headlines. Linder said, "There's no word on when we'll start to see smartphones that feature Sony's new image sensor, but Sony's camera technology is pretty popular with phone makers, so it's probably just a matter of time."